Malpe Beach is a beautiful beach located 66 kms from Mangalore (Mangaluru). It is just 6 kms from Udupi, the temple town renowned for a fascinating idol of Lord Krishna. Malpe with its sheltered harbor makes a quiet beach retreat. It is a popular picnic spot because of its pristine beauty and peaceful surrounding. The endless stretch of golden sand, swaying Palm trees, clear blue sky and the gurgle of the sea attracts tourists to this spot. Malpe is an idyllic place for boating, fishing, bathing, angling etc. 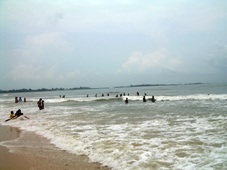 Malpe has become a hot holiday destination in South India in the recent years. a. Paradise Isle - a night clubbers spot. St. Mary's Island (Coconut Island and Thonsepar) is to the north of the port of Malpe 7 kms from Udupi. Vasco-da-Gama landed on one of these islands and called it `EI Padron de Santa Maria'. It is from this that these islands got their present name. They are just a few scattered projections of rock rising out of the western or Arabian Sea around Malpe. The Islands form one of the four geological monuments in Karnataka State. The best time to visit the beach is between October and January. By air : The nearest air route to reach Malpe is Mangalore Airport (formerly known as Bajpe Airport). By rail : The nearest railway station is Udupi. 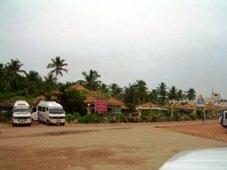 By road : Malpe is well connected with good network of roads.